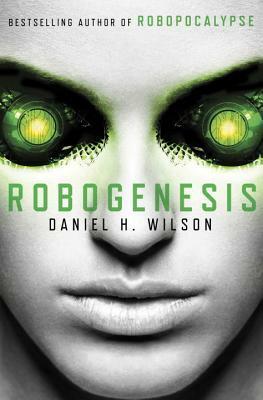 While I appreciated the logical nature that Daniel H. Wilson brought to the idea of a robot apocalypse in Robopocalypse, I felt the book itself was disjointed as a series of short stories that examined the various forms our robot servants would turn on us. The whole book seemed more like an academic exercise than a piece of fiction. In the follow-up to Robopocalypse, Wilson picks up right where the last book left off. With the exposition of how the robots turned on us already covered, he then is able to fully explore the fictional environment via its characters in Robogenesis. It took me a little while to recall who some of these characters were and what had happened during the previous book, which left me confused in the early moments of each section. Once I eventually got my bearings, the stories themselves were interesting and tied together pretty well. Some of the action was a little disorienting, but overall I had a good idea what was happening. There were a few storylines I would have liked to see fleshed out more (like Matilda’s storyline), as well as some that were perhaps fleshed out too much. And by “fleshed out,” I’m of course referring to the almost gratuitous and graphic violence that’s present in this book. I’m not sure it was really necessary, and it was more unsettling than anything else. I mean, I get that the end of the world will be violent, but it doesn’t need to be described in gory detail. At least by the end of the book, it looks like there’s a satisfying conclusion, but with the clear indication that the war is not over. This means I’ll probably have to read the next book in this series whenever it comes out. A good sci-fi that blends realism with a few entertaining characters, I give Robogenesis 3.5 stars out of 5.